In August, the Federal Communications Commission issued the One Touch Make Ready (OTMR) order, a set of rules designed to speed up deployment and help get the country prepped for 5G technology. 5G promises faster speeds for consumers on both stationary and mobile devices. The FCC estimates that—to improve wireless coverage—150,000 small cell attachments will be deployed by the end of 2018 and 455,000 by 2020. In addition to faster deployment, the new OTMR rules are intended to reduce costs and minimize disruptions in ROW areas, such as streets and sidewalks. The potential impact is enormous. “By some estimates, OTMR alone could result in approximately 8.3 million incremental premises passed with fiber and about $12.6 billion in incremental fiber capital expenditures,” the FCC's order states. What is One Touch Make Ready? The One Touch Make Ready policy fundamentally changes previous installation methods for utility pole attachments. 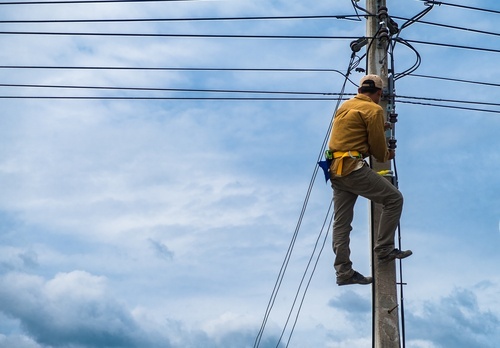 The key change is the FCC’s decision to allow the attaching company and approved contractors to perform all work necessary in placing their own equipment on the poles, including temporarily moving any equipment owned by the utility or other attachers, with only one trip to the pole. Until now, the attaching company had to wait (sometimes for months at a time) for each owner or attacher with equipment on the pole to move their assets individually, a much longer process than OTMR. Along with the game-changing order, the FCC approved tighter deadlines to shorten many of the steps in the deployment process. The order allows the attacher to proceed with the work, even if the asset owner doesn’t meet the mandated deadlines. Fortunately, the new rules include built-in protections for both asset owners and attachers. It prohibits state and local governments from declaring moratoria that stops broadband deployments. It establishes qualifications that contractors must meet to ensure safe and reliable OTMR work. Utilities are encouraged to create their own lists of approved contractors. If they don’t do so, attachers may use the FCC’s requirements to hire qualified contractors. It sets rules for determining whether an attachment application is complete. It also sets time limits for the asset owner to make that determination. It gives asset owners and attaching companies the responsibility for making decisions and taking action on new attachments. The role of existing attachers in the process is reduced, although they must be notified of any plans for new attachments and are allowed to have representatives present when the work is done. It establishes procedures that must be followed if existing equipment is damaged during installation of a new attachment, although the FCC says the rules are designed to make it unlikely that will occur. Twenty states and the District of Columbia are certified to regulate pole attachments within their boundaries, so the new rules apply only in the remaining 30 states where the FCC fills that role. The 30 states affected by the order are Alabama, Arizona, Colorado, Florida, Georgia, Hawaii, Indiana, Iowa, Kansas, Maryland, Minnesota, Mississippi, Missouri, Montana, Nebraska, Nevada, New Mexico, North Carolina, North Dakota, Oklahoma, Pennsylvania, Rhode Island, South Carolina, South Dakota, Tennessee, Texas, Virginia, West Virginia, Wisconsin and Wyoming. Simple vs Complex Attachments: A simple attachment is one that can be deployed without any reasonable expectation of a service outage or damage to existing equipment. It does not require existing equipment to be spliced or relocated, although that equipment may be moved temporarily to allow placement of the new attachment. OTMR does not apply to complex attachments, which fall under a different set of FCC deployment rules. The order establishes a joint use procedure for determining whether a proposed attachment is simple or complex. Communications Space: A utility pole is divided into three spaces. The bottom of the pole is unusable for most attachments, although distributed antenna systems (DAS) and some other types of attachments can (sometimes) be placed there. The electric space is at the top of the pole, where high voltages are present. Between those two spaces is the communications space, where low-voltage equipment can be placed including fiber, copper and coaxial cables. OTMR is allowed only for attachments in the communications space. Even with these restrictions, the FCC says OTMR covers the majority of projects being proposed, although it notes an increase in proposals for wireless small cell attachments on top of poles, in the electric space. In addition to creating OTMR, the commission revised some of its existing rules governing deployment of complex attachments. OTMR gives new attachers much more control over the speed of deployment, but it also contains many provisions to ensure asset owners have a substantial opportunity to guide the process. One Touch Make Ready requires all parties in the joint use community to adjust current processes in business. Deployment of new attachments is skyrocketing, but the need to ensure the quality and safety of the work is as great as ever. The coming months and years will be challenging, but effective solutions are available to help the joint use community navigate the unfamiliar requirements. Alden has recently partnered with McLean Engineering to provide an automated OTMR workflow in the Alden One® joint use platform, streamlining the process for all parties involved. The workflow makes OTMR processes efficient and predictable, while ensuring safety for field technicians. It also guarantees FCC compliance by meeting standard OTMR timelines. If your company needs help complying with the One Touch Make Ready policy, we are happy to speak with you about our solution. Alden walks with our clients each step of the way, ensuring a path to success. If you would like more information about the Alden One® OTMR workflow, reach out to one of our product specialists today.